The stems arw chiefly covered with silky white hairs and yellow spines. It grows well. Origin and Habitat: Oreocereus doelzianus var. sericatus grows in the department of Ayacucho, central Peru, on the western cordillera. Altitude: 2300-2500 metres above sea level. 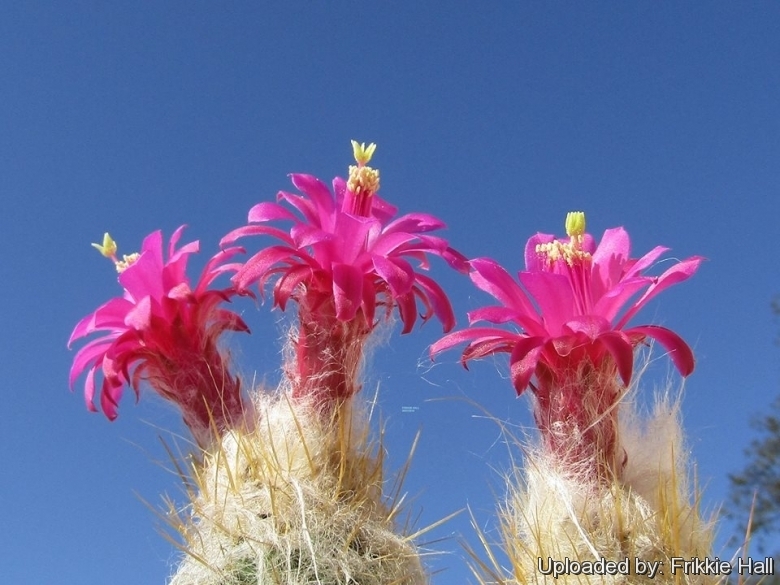 Habitat: This plants occurs in high altitudes mainly in the eastern slopes together with Tephrocactus sp. and are covered with wool as a protection against the cold. 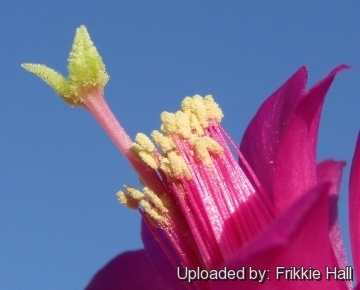 The flowers are bright red and zygomorphic, suggesting that they are pollinated by birds. Description: In recent times Morawetzia sericata has been referred to Oreocereus (Oreocereus doelzianus var. 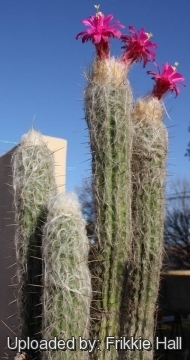 sericatus), but differing from other Oreocereus in forming a cephalium of wool and long bristles on the ends of the flowering shoots. The flowers are carmine. They form low colonies of slender cerei with many erect stems, branched from the base or a little above ground. Stem: Bright green with blunt ribs that protrude less than 1 cm and are slightly prominent where the areoles are borne. Stems up to about 1 m tall x 6-8 cm in diameter. Areoles: Circular, greyish-white and felted, separated by slight depressions, 1,5 cm apart. Spines: Stems are covered in long, white, hair-like, silky spines without bristle tufts, (which becomes more dense in strong light) to protect them from the mountain cold and hot sun. Hidden in this white down are up to 20, to 3 cm long, stout, needle-like spines yellow or straw-coloured. 4 long centrals sometime develops later. 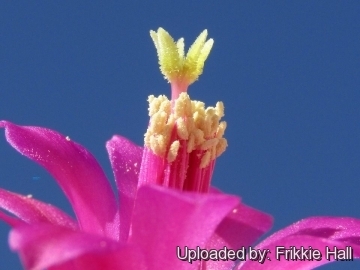 Flowers: Has deep purplish pink, vermilion-red blossoms to about 10 x 3 cm. 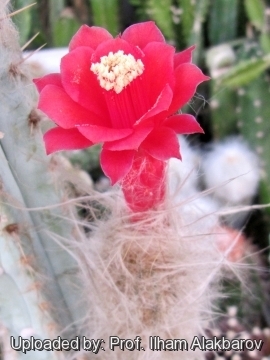 Scales of tube with numerous loose axillary hairs, limb oblique with rounded petals. 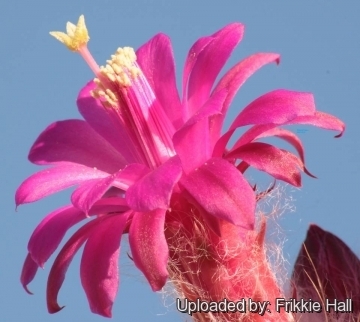 Notes: This plant was previously included in the segregate genus Morawetzia (Backeb.) 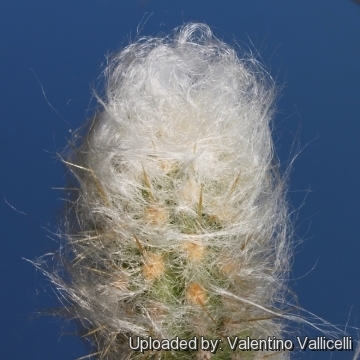 that differ from Oreocereus because of the apical cephalium consisting of hairs and bristles and becoming clavate at the apex. Flowers arise from this cephalium. 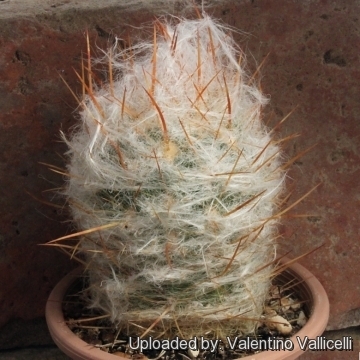 Cultivation and Propagation: This is a frost hardy cactus that grow at high altitude (hardy to -12°C) It need full sun exposures. Grow in a rich, porous and draining soil and let their soil dry out between waterings. Repot in the spring, when their roots become cramped. Generally, they should be repotted every other year in order to provide fresh soil. After repotting, do not water for a week or more.